A huge thanks to the brands that participated in this post and provided samples for us to donate! This post contains affiliate links. 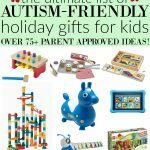 Keep scrolling to see our list of the Best Holiday Gifts for Kids! Are you stuffed from all of that delicious Thanksgiving food still? 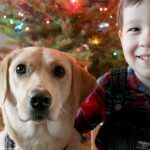 I am so excited about today’s post because it gave me an excuse to do some online browsing and figure out what I’m going to get the boys this Christmas. Every year we release Holiday Gift Guides for you to shop, but this year we did it a little differently – we requested samples from some of the retailers and we’re donating the items to a local charity! Pretty cool, right? So while you shop, know that a lot of time and thought went into selecting each one of these special items. I hope you love this list as much as we do and find something special on it for someone you love. JoJo Wooden Toy Garage // JoJo Maman Bebe | We have and absolutely LOVE this fun toy garage. 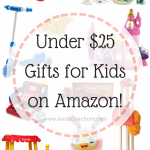 It comes with cars, cones, and more so your child will have everything they need to play! 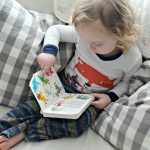 Penguin Cashmere Mix Christmas Sweater // JoJo Maman Bebe | Looking for that perfect Christmas sweater for your little one? This is it! Wyatt will be wearing this exact same sweater on Christmas, and Levi will be wearing this adorable polar bear sweater. Russian Doll Skittles // JoJo Maman Bebe | How cute are these? Suitable for 1+ and perfect for lining up, counting practice, and so much more! Comes with 6 skittles and 2 balls. Beginner Baking Set Suitcase // Cost Plus World Market | We have this exact baking set at home and the boys absolutely love it. It comes with everything you need to bake some pretend cupcakes and will keep the kids busy for hours! This toy is great for encouraging imaginary play and creativity, plus, it’s under $20! Paint Your Own Tea Set // Cost Plus World Market | I love gifting my kids activities that they can do over winter break. This paint your own tea set is on our to-buy list because it’s an all-in-one kit that comes with everything we need for some fun family art time, and you can’t beat the price! Spirograph Travel Tin // Cost Plus World Market | This is travel tin is the perfect stocking stuffer size and loaded with fun! Create geometric designs with colorful pens (all included in the kit). This is also great for any upcoming winter road trips you’ve got planned. Elly Coupe Kids Car // Simplay3 | This is the perfect riding toy for toddlers 18 months old to 5 years old! It’s friendly elephant design includes a cozy seat, durable construction, and it’s oh-so easy to turn the wheels for foot to floor maneuverability. This sweet elephant car is the perfect gift for this season! Kids Super Coupe Pedal Car w/ Roof and 3-Position Seat // Simplay3 | These pedal trikes are so much fun! The boys each have one and they get so much use out of them! [Here is a photo of the boys riding them if you want to get a better idea size-wise.] I absolutely love the design and colors of these, so on trend. AND the seats are adjustable so you can move it forward or back to fit your child. The large front wheel gives great traction, and the high arching oval roof creates a safe and roomy spot for your kiddo to cruise. Rocking Dinosaur // JoJo Maman Bebe | How adorable is this rocking dinosaur? It had to make our list because it’s something every little one would love to see under the tree this year. This is suitable for 18 months + and the dino is made of a super soft velour material so your little one will be nice and comfy. Fisher-Price Little People Caring For Animals Farm Playset // Amazon | We love little people sets and have several for the boys. They love getting them all out and playing with them together, and all of the animal and people are super durable so the sets we get last for years and years! furReal Roarin’ Tyler, the Playful Tiger // Amazon | This is on Levi’s Christmas list this year because he absolutely loves animals and wants a tiger of his very own to take care of. This tiger has over 100 sound and motion combinations and even responds to his squeaky toy (included). EURO EDGE KITCHEN™ // Step2 | We really can’t say enough good things about this kitchen. The boys were drawn to the colors, drawers, stovetop, and accessories. The stove top has lights and the fridge door has working LED lights so you can see everything inside. This kitchen is made in the USA, and comes with a 31 piece accessory set! DISNEY PRINCESS© CHARIOT WAGON™ // Step2 | Make any girl feel like a princess with this Disney Princess Chariot Wagon! This wagon features Whisper Wheels™ so it has a smooth and quiet ride. The door features all of your favorite Disney Princess© characters, too! It also has an extra-long wagon handle that folds and locks underneath for easy storage and transport, perfect and simple for taking your little princess around. The Everest Penguin Doll // Cuddle and Kind | When you purchase a cuddle and kind doll, you’re also providing 10 meals to children in North America and around the world. The dolls are fair trade and are hand knit with premium 100% cotton yarn. They’re the perfect companion for your kiddo and come in two different sizes: little 13″ and regular 20″. Disney Cars Pixar Cars 3 Tech Touch Lightning McQueen // Amazon | This large-scale motorized Lightning McQueen has a built-in 3″ full-color touchscreen interface and real working headlights and tail lights! The eyes, mouth and vehicle body move in response to the action, just like the real Lightning McQueen! This is on our must-gift list for the boys this Christmas! Melissa & Doug Wooden Make-a-Cake Mixer Set (11 pcs) // Amazon | This sweet little wooden baking set from Melissa and Doug is what kids dreams are made of. It comes with everything needed for kiddos to make a pretend cake, even the steps on a recipe card! Nickelodeon Paw Patrol – Sea Patrol – Sea Patroller Transforming Vehicle with Lights and Sounds // Amazon | This is one of the boys favorite toys! It comes with a few pieces for play, and transforms from a boat to vehicle. It’s a bigger toy, so it’d be perfect for the big gift this holiday! Cloud b Tranquil Turtle Night Light, Ocean // Amazon | Both of my boys have one of these in their rooms and they’re so soothing. They project faint waves of light like the water and have both water only sounds and musical sounds, too. VTech Kidizoom Smartwatch DX // Amazon | This smart watch is so much fun! It features 3 fun activities, 5 games, 3 action challenges and a motion sensor. Kids can take pictures and video with it, too! And it comes in a ton of colors! Wooden Stacking, Pulling Train // Amazon | How cute is this little train? Perfect for little ones to build and pull. Vtech Drill and Learn Toolbox // Amazon | This little toolbox is full of a ton of fun features. It even has a working drill that spins the gears and drills screws into the electronic tray’s holes! Cuddle and Kind: (Nov 24-28) Doubling the impact for ALL orders. When you purchase one doll, it will provide 20 meals instead of 10. There is also free shipping during the same time with code GIVETHANKS. JoJo Maman Bebe: (Nov 22nd – 27th) Shop Black Friday Deals HERE.